Opening plenary at the 2017 PlacesForBikes Conference. If you’ve got ideas that need sharing with hundreds of the country’s smartest bike-related thinkers and doers, now’s your chance. The 2018 PlacesForBikes Conference is May 1-3 in Indianapolis. Launched last year, the event is unique for its compact structure, its can-do attitude and its focus on cross-pollinating ideas among elected officials, public employees, community leaders and advocates and the private bicycling industry. The panels are multidisciplinary; the keynotes are unexpected. We’d love to consider having your voice among them in 2018. We’re inviting speaker and session proposals through Jan. 12. PLAN for the community you want to create, and put in place the policy framework. BUILD the facilities that will get people riding. ENGAGE other leaders and the community, and get people excited about riding. MEASURE your progress toward your goals. If you don’t want to speak yourself, but have someone in mind who would be good, we’d love to hear about that too. 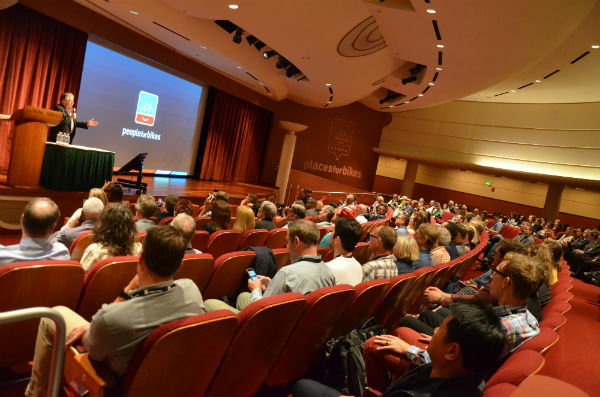 Speakers receive $200 off conference registration.